The earliest recorded organization of securities trading in New York among brokers directly dealing with each other can be traced to the Buttonwood Agreement. Previously securities exchange had been intermediated by the auctioneers who also conducted more mundane auctions of commodities such as wheat and tobacco. On May 17, 1792 twenty four brokers signed the Buttonwood Agreement which set a floor commission rate charged to clients and bound the signers to give preference to the other signers in securities sales. The earliest securities traded were mostly governmental securities such as War Bonds from the Revolutionary War and First Bank of the United States stock, although Bank of New York stock was a non-governmental security traded in the early days. The invention of the electrical telegraph consolidated markets, and New York's market rose to dominance over Philadelphia after weathering some market panics better than other alternatives. The Civil War greatly stimulated speculative securities trading in New York. By 1869 membership had to be capped, and has been sporadically increased since. The latter half of the nineteenth century saw rapid growth in securities trading. Securities trade in the latter nineteenth and early twentieth centuries was prone to panics and crashes. Government regulation of securities trading was eventually seen as necessary, with arguably the most dramatic changes occurring in the 1930s after a major stock market crash precipitated an economic depression. 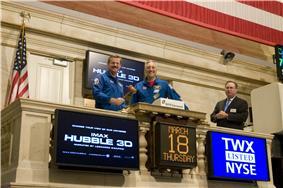 The NYSE announced its plans to merge with NYSE Euronext, the first transatlantic stock exchange. Prior to the acquisition of NYSE Euronext by the ICE in 2013, Marsh Carter was the Chairman of the NYSE and the CEO was Duncan Niederauer. Presently, the Chairman is Jeffrey Sprecher. On September 16, 1920, a JP Morgan building, still have marks on their façades caused by the bombing. One of Abbie Hoffman's well-known publicity stunts took place in 1967, when he led members of the Yippie movement to the Exchange's gallery. The provocateurs hurled fistfuls of dollars toward the trading floor below. Some traders booed, and some laughed and waved. 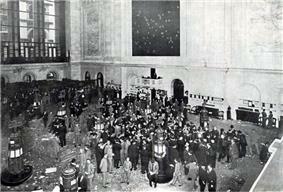 Three months later the stock exchange enclosed the gallery with bulletproof glass. Hoffman wrote a decade later, "We didn't call the press; at that time we really had no notion of anything called a media event". On January 26, 2000, an altercation during filming of the music video for "Sleep Now in the Fire", which was directed by Michael Moore, caused the doors of the exchange to be closed and the band Rage Against the Machine to be escorted from the site by security after band members attempted to gain entry into the exchange. The video shoot had attracted several hundred people, according to a representative for the city’s Deputy Commissioner for Public Information. New York City's film office does not allow weekday film shoots on Wall Street. Moore had permission to use the steps of Federal Hall but did not have a permit to shoot on the sidewalk or the street, nor did he have a loud-noise permit or the proper parking permits. "Michael basically gave us one directorial instruction, "No matter what happens, don't stop playing," Tom Morello recalls. When the band left the steps, NYPD apprehended Moore and led him away. Moore yelled to the band, "Take the New York Stock Exchange!" In an interview with the Socialist Worker, Morello said he and scores of others ran into the Stock Exchange. "About two hundred of us got through the first set of doors, but our charge was stopped when the Stock Exchange's titanium riot doors came crashing down." "For a few minutes, Rage Against the Machine was able to shut down American capitalism," Moore said. "An act that I am sure tens of thousands of downsized citizens would cheer." Trading on the exchange floor, however, continued uninterrupted. 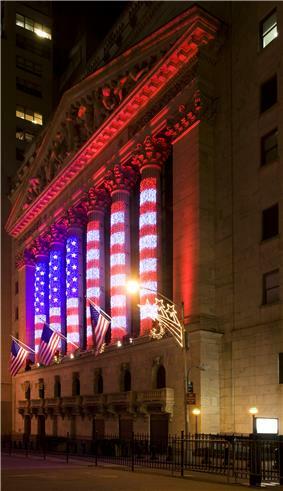 In the aftermath of the September 11, 2001 terrorist attacks, the NYSE was closed for 4 trading sessions, resuming on Monday, September 17, one of the rare times the NYSE was closed for more than one session and only the third time since March 1933. On July 8, 2015, technical issues affected the stock exchange, halting trading at 11:32 am ET. The NYSE reassured stock traders that the outage was "not a result of a cyber breach", and the Department of Homeland Security confirmed that there was "no sign of malicious activity". Trading eventually resumed at 3:10 pm ET the same day. 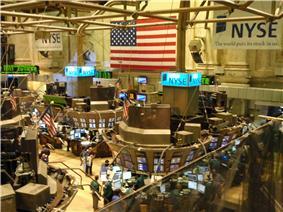 The NYSE trading floor in August 2008. Until 2005, the right to directly trade shares on the exchange was conferred upon owners of the 1366 "seats". The term comes from the fact that up until the 1870s NYSE members sat in chairs to trade. In 1868, the number of seats was fixed at 533, and this number was increased several times over the years. In 1953, the number of seats was set at 1,366. These seats were a sought-after commodity as they conferred the ability to directly trade stock on the NYSE, and seat holders were commonly referred to as members of the NYSE. The Barnes family is the only known lineage to have five generations of NYSE members: Winthrop H. Barnes (admitted 1894), Richard W.P. Barnes (admitted 1926), Richard S. Barnes (admitted 1951), Robert H. Barnes (admitted 1972), Derek J. Barnes (admitted 2003). Seat prices varied widely over the years, generally falling during recessions and rising during economic expansions. The most expensive inflation-adjusted seat was sold in 1929 for $625,000, which, today, would be over six million dollars. In recent times, seats have sold for as high as $4 million in the late 1990s and as low as $1 million in 2001. In 2005, seat prices shot up to $3.25 million as the exchange entered into an agreement to merge with Archipelago and become a for-profit, publicly traded company. Seat owners received $500,000 in cash per seat and 77,000 shares of the newly formed corporation. The NYSE now sells one-year licenses to trade directly on the exchange. Licenses for floor trading are available for $40,000 and a license for bond trading is available for as little as $1,000 as of 2010. Neither are resell-able, but may be transferable in during the change of ownership of a cooperation holding a trading license. In 1817, the constitution of the New York Stock and Exchange Board is adopted. In 1867, the first stock ticker. In 1896, DJIA first published in The Wall Street Journal. In 1906, DJIA exceeds 100 on January 12. In 1914, World War I causes the longest exchange shutdown: four months, two weeks; re-opening December 12 brings the largest one-day percentage drop in the DJIA (24.4%). In 1915, market price is given in dollars. In 1949, the longest (eight-year) bull market begins. In 1954, DJIA surpasses its 1929 peak in inflation-adjusted dollars. In 1956, DJIA closes above 500 for the first time on March 12. In 1971, NYSE recognized as Not-for-Profit organization. In 1972, DJIA closes above 1,000 for the first time on November 14. In 1987, Black Monday, October 19, sees the second-largest one-day DJIA percentage drop (22.6%) in history. In 1991, DJIA exceeds 3,000. In 1995, DJIA exceeds 5,000. In 1999, DJIA exceeds 10,000 on March 29. 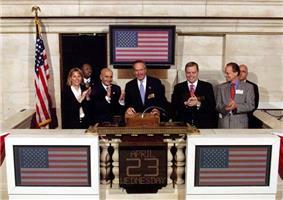 In 2000, DJIA peaks at 11,722.98 on January 14; first NYSE global index is launched under the ticker NYIID. In 2001, trading in fractions (n/16) ends, replaced by decimals (increments of $.01, see Decimalization); September 11, 2001 attacks occur causing NYSE to close for 4 sessions. In 2007, US President Federal Open Market Committee interest-rate decision on January 31; NYSE announces its merger with the American Stock Exchange; NYSE Composite closes above 10,000 on June 1; DJIA exceeds 14,000 on July 19 and closes at a peak of 14,164.53 on October 9. In 2008, DJIA loses more than 500 points on September 15 amid fears of bank failures, resulting in a permanent prohibition of naked short selling and a three-week temporary ban on all short selling of financial stocks; in spite of this, record volatility continues for the next two months, culminating at 5½-year market lows. In 2009, DJIA closes at 6,547.05 on March 9 reaching a 12-year low; DJIA returns to 10,015.86 on October 14. In 2013, DJIA closes above 2007 highs on March 5; DJIA closes above 16,500 to end the year. In 2014, DJIA closes above 17,000 on July 3 and above 18,000 on December 23. In 2014, DJIA achieved an all-time high of 18,351.36 on 19 May 2015. In 2015, DJIA dropped over 1,000 points to 15,370.33 soon after open on 24 August 2015, before bouncing back and closing at 15,795.72, a drop of over 669 points. On February 15, 2011 NYSE and Deutsche Börse announced their merger to form a new company, as yet unnamed, wherein Deutsche Börse shareholders will have 60% ownership of the new entity, and NYSE Euronext shareholders will have 40%. In April 2011, Intercontinental Exchange (ICE), an American futures exchange, and NASDAQ OMX Group had together made an unsolicited proposal to buy NYSE Euronext for approximately US$11 billion, a deal in which NASDAQ would have taken control of the stock exchanges. NYSE Euronext rejected this offer twice, but it was finally terminated after the United States Department of Justice indicated their intention to block the deal due to antitrust concerns. In December 2012, it was announced that ICE had proposed to buy NYSE Euronext in a stock swap with a valuation of $8 billion. NYSE Euronext shareholders would receive either $33.12 in cash, or $11.27 in cash and approximately a sixth of a share of ICE. The Chairman and CEO of ICE, Jeffrey Sprecher, will retain those positions, but four members of the NYSE Board of Directors will be added to the ICE board. The signal to start and stop trading wasn't always a bell. The original signal was a gavel (which is still in use today along with the bell), but during the late 1800s, the NYSE decided to switch the gavel for a gong to signal the day's beginning and end. 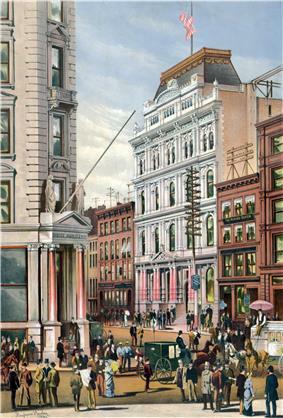 After the NYSE changed to its present location at 18 Broad Street in 1903, the gong was switched to the bell format that is currently being used. A common sight today is the highly publicized events in which a celebrity or executive from a corporation stands behind the NYSE podium and pushes the button that signals the bells to ring. Many consider the act of ringing the bells to be quite an honor and a symbol of a lifetime of achievement. Furthermore, due to the amount of coverage that the opening/closing bells receive, many companies coordinate new product launches and other marketing-related events to start on the same day as when the company's representatives ring the bell. This daily tradition wasn't always this highly publicized either. 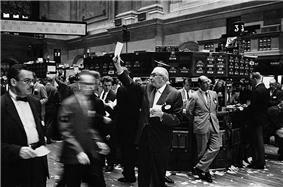 In fact, it was only in 1995 that the NYSE began having special guests ring the bells on a regular basis. Prior to that, ringing the bells was usually the responsibility of the exchange's floor managers. Many of the people who ring the bell are business executives whose companies trade on the exchange. However, there have also been many famous people from outside the world of business that have rung the bell. Athletes such as Joe DiMaggio of the New York Yankees and Olympic swimming champion Michael Phelps, entertainers such as rapper Snoop Dogg and members of the band Kiss, and politicians such as Mayor of New York City Rudy Giuliani and President of South Africa Nelson Mandela have all had the honor of ringing the bell. Two United Nations Secretaries General have also rung the bell. On April 27, 2006, Secretary-General Kofi Annan rang the opening bell to launch the United Nations Principles for Responsible Investment. On July 24, 2013, Secretary-General Ban Ki-moon rang the closing bell to celebrate the NYSE joining the United Nations Sustainable Stock Exchanges initiative. In addition there have been many bell-ringers who are famous for heroic deeds, such as members of the New York police and fire departments following the events of 9/11, members of the charitable organizations. ^ National Park Service, National Historic Landmarks Survey, New York, Retrieved May 31, 2007.